As always, please confirm your assignments with an e-mail to mark.bernat@gmail.com by Wednesday night each week. Please confirm as soon as possible, don’t wait for the deadline. Make sure to include at least the number of games you are confirming each day so that I’ll know you have them all when I mark them off. Many of you have lost your games in the fall for not confirming on time. Non confirmations will be replaced without notice and you can be removed from the assignment list completely. NOTE: As changes occur through the week, if you are *added* to games you will be notified via e-mail. You do not have to keep checking back over and over after the initial schedules are published. Note: if you see any openings you can fill please contact Mark ASAP. Please be patient with cancellations — both leagues are working through processes and are dealing with team reschedules. Leaders from SCSA and WRSA presented referee information at the Spring Referee meeting. The following is the handout that they presented at the meeting. WRSA league games begin Friday March 1, opening weekend schedules will be published Tuesday February 26. Even though the new website technically supports e-mail distribution…we have historically used an e-mail distribution list signup that allows you to signup from as many e-mail addresses as you want (work, home, parents, etc). Most information is posted on the website – but we often have “immediate” info that needs to go out (need a referee for a game that day, etc)….this information is put first on the e-mail distribution list. 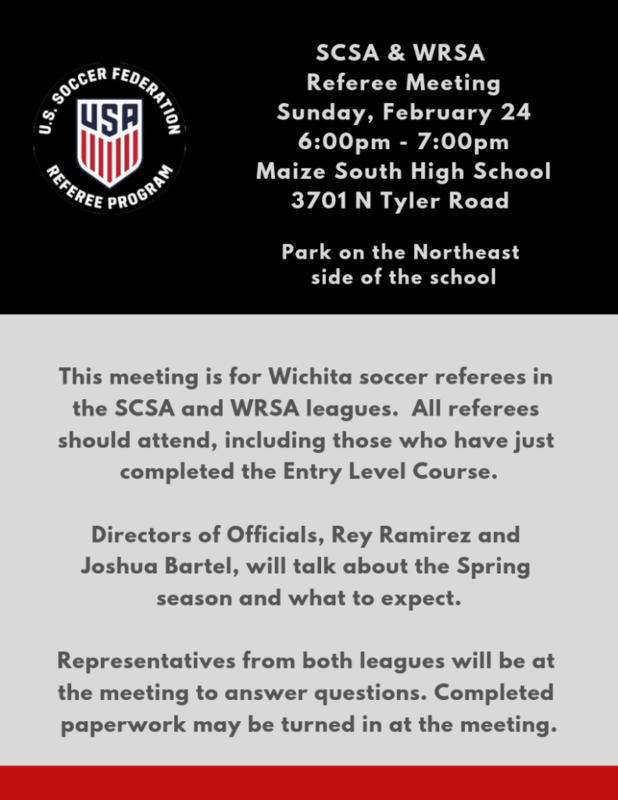 Referees probably have many questions about the upcoming seasons with multiple leagues and tournament games as we support both SCSA and WRSA leagues. We are choosing to keep the assigning process the same for continuity. We may update to a better app/tool soon but for the Spring 2019 season and foreseeable future – please submit your availabilty as normal. If you live near a specific complex or perhaps have a sibling playing at one complex or the other and would like for me to try and schedule you at that same complex please put those notes in your “requests” as you submit availability for a specific week. WRSA games are going to be at Stryker. SCSA games will be mostly at Southlakes but they will also have some games scheduled at Stryker. We’ll potentially have tournament games at both facilities and it is possible that we’ll be supporting a tournament at one facility and league games at the other on the same date. The assigning process will always be to do what is best for the game and for the referee development. We’ll evaluate each game level individually and try to work the best crews possible into those games while honoring your location requests *when possible*.